Over the years there have been so many depictions of Peter Lorre and allusions to him in comic strips, animated cartoons, comedy sketches and stand-up routines, radio plays, stage plays, television programs and films, advertising, popular music, and literature that it would be futile to try to track down and catalog them all. Still the notion persists that Peter was an obscure and insignificant cultural figure. 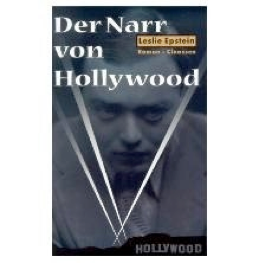 When Leslie Epstein decided to write a novel about Hollywood Jews during the Holocaust, and to make Peter Lorre his protagonist, he apparently did no research, perhaps because his father and uncle were screenwriters on a couple of films Peter appeared in and he felt that this gave him the authority to write about Peter’s Hollywood career without really knowing any specifics about it. This grossly defamatory, entirely imaginary portrait of Peter was accepted without question. “Pandaemonium” got enthusiastic reviews, won awards, and was chosen one of the “New York Times Book Review”’s notable books of 1997. Jack Terricloth, front man for the punk band World Inferno Friendship Society, used “Pandaemonium” as the basis for his song cycle “Addicted to Bad Ideas: Peter Lorre’s Twentieth Century,” in which he reimagines Epstein’s Peter as a decadent and self-destructive rock and roll star. Like Epstein, Terricloth felt no sense of responsibility to the historical Peter and never bothered to check his facts. E.g., his Peter, like Epstein’s, is a cocaine addict, though Peter's authorized biographer Stephen D. Youngkin has established that Peter became addicted to morphine in the 1920s while recovering from a life-threatening illness, and during his short-lived periods of recovery used to self-medicate with hard liquor and Demerol, which again are central nervous system depressants, the very opposite of a casual party drug like cocaine. This is not a small mistake. You have to give Peter his due. Managing to carry on a successful Hollywood career under the malevolent eye of J. Edgar Hoover, who during the 1940s actually put Peter in federal narcotics prison and threatened to ruin him by publicly exposing his addiction, demonstrates an almost heroic tenacity. To portray him as just a neurotic cocaine sniffer who couldn't get laid borders on defamation. Epstein’s decision to use the name Peter Lorre for an essentially fictional character is a prime example of the tendency to think of Peter as a folk character rather than a human being. Epstein chose Peter because his name has a publicity value, and thus a monetary value, that it wouldn’t if he weren’t a bona fide movie star. However, while other characters in the novel are clearly based on Jack Warner, Marlene Dietrich, and Erich von Stroheim, Epstein chose to give them fictional identities, though all of these individuals were dead when the book was published and could have been libeled with as much impunity as Peter. But Warner, Dietrich and Stroheim do not occupy the same plane of cultural iconography as Peter. Those of us who know who they were are also aware of their existence as actual human beings with published life stories, and if you made up ignorant lies about them, people might notice and object. Those critics who gave Epstein high marks for creativity and originality for creating a bawdy, flamboyant, darkly comic novel featuring Peter Lorre are probably unaware that not only wasn’t it an original idea, but that another American novelist had done it much better three decades before. 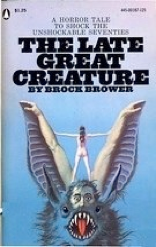 Brock Brower may have chosen to use the name Simon Moro for the protagonist of his 1968 novel “The Late Great Creature” rather than calling him Peter Lorre out of respect, since Peter had only been dead for a couple of years when the book came out, or perhaps because Brower felt freer to take liberties with a clearly fictional character than a specifically historical one (the postmodern disregard for boundaries between truth and fiction had not come into fashion yet), or because living persons like Jacob Moreno, Vincent Price and Roger Corman were also depicted in the novel in a highly libelous manner, or maybe because he couldn’t have written a faithful account of Peter’s life if he had wanted to because he simply didn’t have the necessary information to do it. Until “The Films of Peter Lorre,” featuring Youngkin's first attempt at a biography of Peter, was published in 1984 there was next to no reliable information available in print about Peter’s life. Brower had interviewed Peter as part of a 1964 “Esquire” magazine feature article about the making of the film “The Raven,” and had apparently found him interesting enough to dig around and find out what he could about him, probably mostly by word of mouth, thus giving him the idea for this novel. What’s fascinating about “The Late Great Creature” is that, despite the fact that it is almost a complete fantasy, it comes closer to recreating what the real Peter Lorre must have been like than anything else written about him. “The Late Great Creature” is structured like “Citizen Kane,” with a journalist on a quest to uncover the hidden life story of Simon Moro, a mysterious German actor who specializes in playing haunting, monstrous characters. To find out the truth about Simon is a challenge, since he is a trickster who delights in paradoxes, illusions, and diabolical games. He has a sick sense of humor and ingenious sexual skills that make him a delight to women and a devastating rival to men. Already you get the idea that Simon Moro is radically different than Epstein’s Peter Lorre. Simon is a mercurial, charismatic creature whom you really can imagine being a legendary popular entertainer. He also shares certain unmistakable attributes with the real Peter, such as his fondness for weird practical jokes and his habit of biting people. The fact that Brower does not make Simon Jewish or a drug addict probably means that none of his sources knew these things about Peter. But the escalating shocks of the personal history he invents for Simon indicate that he suspected the high stakes nature of what Peter had so carefully concealed about himself.